Recently my kids and I had the opportunity to explore and review the items in the Gospel Tracts and Evangelism Tools Sampler Pack by Let the Little Children Come. The Gospel Tracts and Evangelism Tools Sampler Pack contains 10 popular Gospel Tracts and Evangelism Tools. Included in the sampler pack: 1 Silicone Salvation Bracelet, 1 Wordless Bracelet Kit, 2 Gospel Buttons FlipAbouts, 3 Animated Tracts, 2 Pop-up Tracts, and 1 Wordless Book. 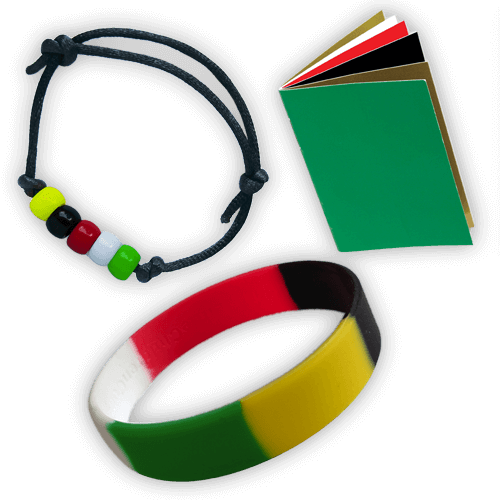 The Silicone Salvation Bracelet, the Wordless Bracelet Kit, and the Wordless Book all provide the opportunity for someone, including children, to share the gospel. Through the five colors that are apart of the wordless items, Yellow (Heaven), Black (Sin), Red (Blood of Jesus), White (Purity), and Green (Growth), the gospel is shared. Children who are told the gospel message through a wordless bracelet or wordless book can then turn around and share the gospel with someone else. Even years later children will remember the wordless books and what they represent. While at Teen Missions, my girls were first introduced to the wordless book when they made wordless books to be sent overseas. When they saw the wordless bracelet in the kit they immediately recognized it and started talking about it. 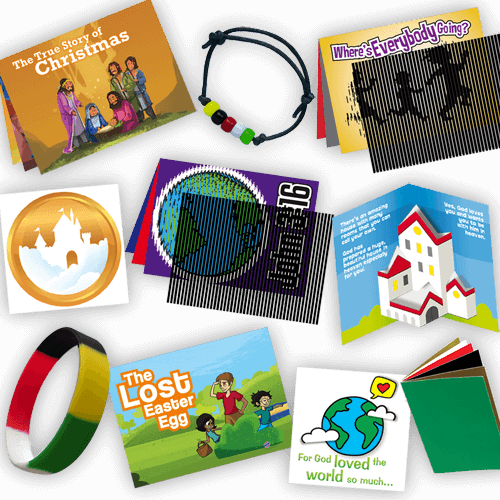 The wordless bracelets and book are a great item to be used during an outreach such as Vacation Bible School or Trunk and Treat as well as brought along on mission’s trips. The items do not take up a lot of space and are lightweight which is perfect for packing in luggage or shipping. The Wordless Bracelet Kits are adjustable. The Silicone Salvation Bracelet that comes with the kit is a size medium but the bracelets are also available in sizes small and large on the Let the Little Children Come website. 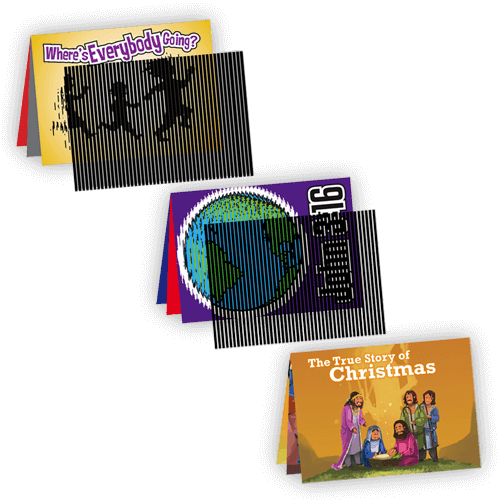 The three Animated Tracts shares the gospel. One through the true story of Christmas, one through the Bible verse John 3:16, and the third through talking about where everyone is going after life here on Earth. Each animated tract comes with a card to make the animations move! In the photos above, Lil ‘Bit is sharing the gospel to Train Buff using the John 3:16 Animated Tract. 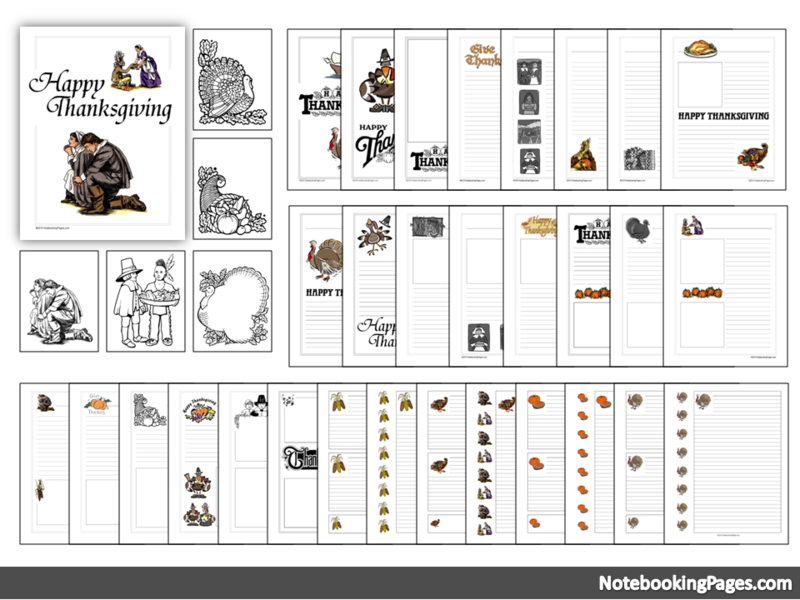 The next two items that I am going to talk about from the kit are the awesome Pop-up Tracts. There are two books one about the Lost Easter Egg and the other one about The Most Amazing House. Both books include a pop-up scene on every page. The pop-ups keep the attention of children while reading the stories inside of the book. The Lost Easter Egg is about three kids hunting for Easter Eggs on Easter. The children are searching high and low for the very last egg. Then one of the children mentions the story of the lost sheep and the shepherd that couldn’t one of his sheep. They relate the story of the lost sheep to them looking for their lost egg. The Most Amazing House is about the most amazing home anywhere in the entire solar system. That is our house I’m Heaven!! The book talks about how we can get to this AMAZING place! 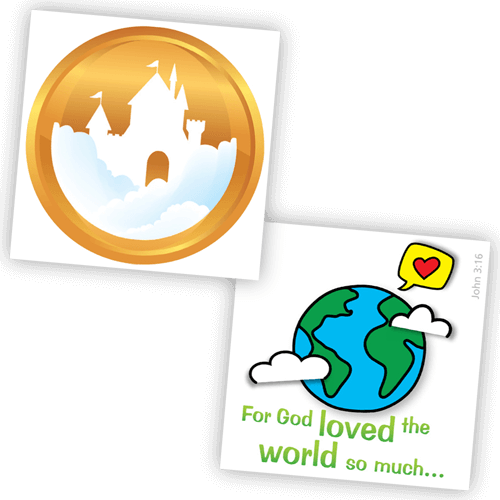 The final two pieces of the Gospel Tracts and Evangelism Tools Sampler Pack are two Gospel Buttons FlipAbouts. The first FlipAbout is a wordless one. Like the other wordless items mentioned earlier, the gospel is shared using only colors. The second FlipAbout is the Bible verse John 3:16. When you are ready to turn the page, fold the FlipAbout in half and open the new page. Once you have flipped through every page you will return to the first. This item is great for elementary age kids! My kids and I thoroughly enjoyed getting to explore the contents of the kit. The older girls enjoyed reading the books to the younger two kids. The oldest three were in agreement that the pop up books were their favorite. While Train Buff and Munchkin were both mesmerized by the animated tracts. 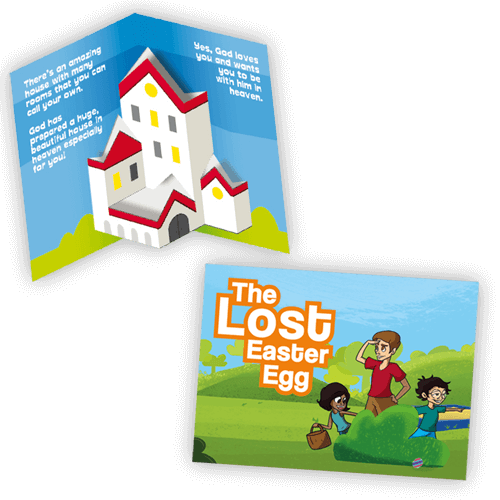 If you are looking for some new evangelism tools I highly suggest checking out the Gospel Tracts and Evangelism Tools Sampler Pack by Let the Little Children Come! Please click the banner below for additional Homeschool Review Crew reviews of the Gospel Tracts and Evangelism Tools Sampler Pack!